Annie Hall Thyme is a dark green, small leaved ground cover thyme suitable for in between paving stones or small lawn areas. It is often included in our popular Flagstone Filler Assortment. Other flagstone fillers are Elfin Thyme, Highland Cream Thyme, Leprechaun Thyme, Mint Thyme, Pink Chintz Thyme White Moss Thyme and Woolly Thyme. This picture tells a story. The two year old planting was a trial of several different small ground cover thymes. The beautifully blooming plant in the foreground is Annie Hall Thyme. The green section right behind it is Mint Thyme. Mint Thyme grows similarly to Annie Hall but it blooms earlier. Here it has finished blooming and is starting to spread outward again. This is the normal growth pattern for creeping thyme. They spread horizontally until they start to bloom and then most of the growth goes upward into the bloom. Beyond the Mint Thyme there is a sad section of dirt. Here Highland Cream Thyme was planted but didn't make it. Highland Cream is a variegated thyme that would have preferred afternoon shade rather than the blazing non-stop sun location of this pathway. Variegated plants have less chlorophyll in the white, cream or pink sections of their leaves which seems to make them more vulnerable to sunburn. Beyond the bare section is a bright green section of Leprechaun Thyme which is our newest addition to the flagstone filler thymes. 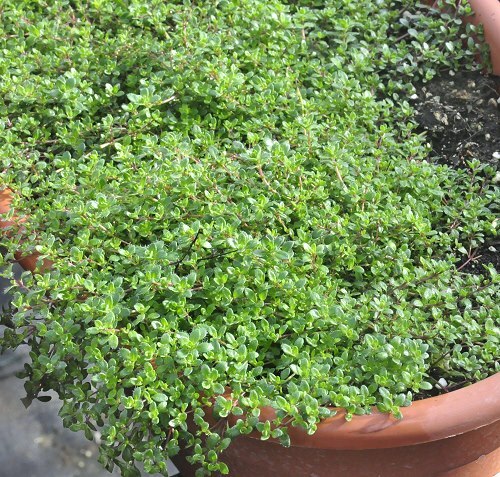 Leprechaun Thyme is grass green, has few flowers and provides a light lemon scent. Behind the Leprechaun Thyme is another bare section that had also been planted in Leprechaun. Unfortunately, the water didn't reach it well enough and it died. 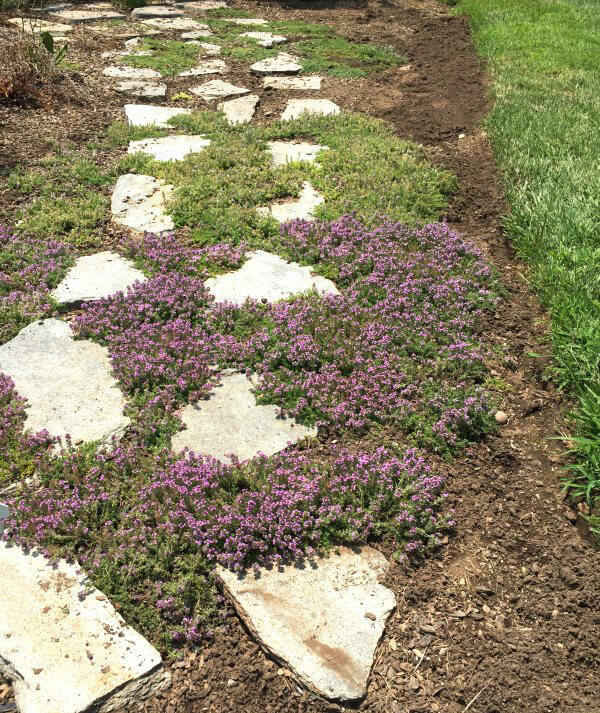 While Thyme takes less water, fertilizer and upkeep than a lawn, it does require adequate moisture. This plant is often available in plug trays. These trays hold 128 of all the same plant. They are a great low cost way to fill a lot of space. Each cell is 3/4 of inch by an inch. Check here to see if Annie Hall Thyme Plug Trays are available.